A lack of predators in the park could exacerbate an outbreak, officials said. New York (CNN) -- Authorities and medical experts warned Friday that a rabies outbreak in Central Park could spread from raccoons to humans. Health investigators have confirmed reports of 28 rabid raccoons in or near Central Park this month and last, compared with just three cases from 2003 through November. The reason is not clear, but the city's health department -- which has been monitoring the situation since December -- is taking it seriously: It's working with the parks department and others to increase surveillance and vaccinate wild raccoons in New York's Central Park, Morningside Park and Riverside Park. 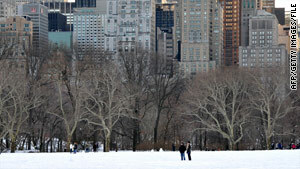 Dr. Charles Rupprecht, chief of the rabies program at the Centers for Disease Control and Prevention, said Friday that ideal conditions in Central Park for animals -- few predators -- could exacerbate an outbreak. "Urban ecosystems sometimes have the ideal measures," he said. "When you get an infectious agent like rabies, it tends to have these untoward effects, meaning an outbreak." Similar outbreaks of rabies in Eastern Pennsylvania and Washington, however, were contained through the same measures that officials in New York are following, he said. In addition to the increased surveillance and vaccinations, authorities in New York are suggesting that visitors to city parks keep pets on a leash and be wary of raccoons they see during the day. Raccoons are nocturnal animals who rarely venture out in the daylight. Being out during the day "means they are probably carrying rabies," said Marlene Elizondo, a nurse with the International SOS, which offers medical care and consulting services to companies, nonprofits and other organizations. "In such a condensed area like New York, it's more likely that a human would come into contact with" a rabid raccoon, Elizondo said. Celina De Leon, a spokeswoman for the New York Department of Health, urged park visitors to alert authorities if they see any animal behaving strangely. Health officials received 10 reports of rabid raccoons in Manhattan last year, but eight of them were in December. It confirmed only one case from 2003 through 2008. Most of the cases it has seen in the past two months were from the northern part of Central Park, between 79th and 110th streets. If left untreated, rabies will infect the central nervous system and ultimately cause death. Health professionals encourage people who come in contact with infected animals to seek medical attention immediately. New York's health department says that "while raccoons, skunks, foxes and coyotes are considered high-risk sources of virus, bats are the most common source of infection for people across the United States."